This Austro-Hungarian cream of horseradish soup recipe is enriched with heavy whipping cream and egg yolks for an unusual yet satisfying first course. We adapted this recipe from one in "The Viennese Kitchen: Tante Hertha's Book of Family Recipes" by Monica Meehan and Maria von Baich (Interlink Books, 2011). There is a huge crossover of recipes among Austrian, Hungarian and German cuisines, where this would be known as a cream soup or krensuppe. Although the names may be spelled differently, the flavor is the same or very similar. Horseradish root is native to the warmer climes of Eastern Europe, and some say Asia, and it appears in recipes worldwide. 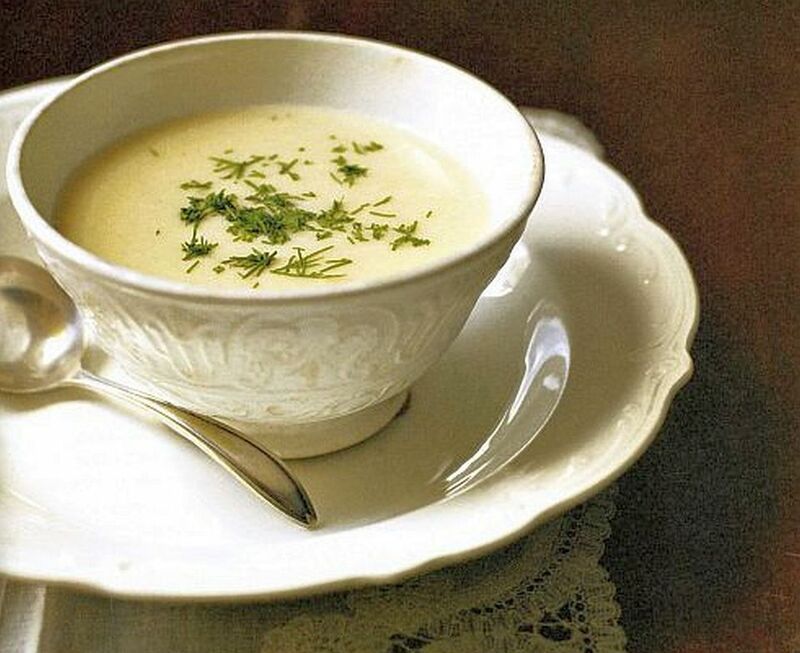 Compare the Austro-Hungarian version with this Polish horseradish soup recipe, which is creamed with sour cream, not heavy cream as in this recipe. Wash, peel and cut 1 pound starchy potatoes, like russets, into 1/2-inch chunks and coarsely chop the 2 medium onions. Heat 1 1/2 ounces butter in a large saucepan or Dutch oven over low-to-medium heat until bubbling. Add the potatoes and onions, and increase the heat to full medium, stirring occasionally, until the onions turn just translucent, but not mushy and certainly not browned. Add 2 cups vegetable stock and 1 cup low-sodium chicken stock to the pot, cover and bring to a boil. Reduce the heat to low-medium and simmer, uncovered, until the potatoes are tender, which should take about 20 minutes. Remove the pan from the heat and purée the contents directly in the pot using a hand-held immersion blender. Return the pot to medium heat and stir in the 1 cup heavy whipping cream, increasing the heat a little to bring to a gentle, but not rolling, boil. Immediately remove from the heat. In a small bowl, whisk the 1 large egg yolk with 2 tablespoons dry white wine and ​temper with a few ladles of hot soup, then return the tempered egg yolk-wine mixture to the pot, and whisk constantly until well incorporated and slightly thickened. Finally, stir in the 1 1/2 ounces grated fresh horseradish root and season to taste with salt and pepper, but do test the soup first, since the stock may already contain enough salt. Serve hot and garnish with chopped fresh dill. You might also enjoy this Austro-Hungarian creamed pumpkin side dish recipe, which is from the same book.